When Kain destroyed the Pillar of Balance, he formed a rift between the worlds. The Vamperor, supreme ruler of the Demon Dimensions, reacted quickly and sent his most loyal servant into the world of the living to gain a foothold. The Sarafan Lord was that servant. It took centuries, but the Sarafan Lord grew in power. His strength and magical prowess were beyond that of any human, and his intimidating appearance, brown masked with an aura of green fire around it, caused many to label him as a deity. Knowing human history, how they like to form groups and crusades, he revived the long-dead Sarafan Order and with a cause to wipe out Nosgoth’s vampires, he was elected to be the ruler of the capital city of Nosgoth, Meridian. As he ruled for centuries, he was secretly using the ancient technology in the Hylden Catacombs beneath the city, to clone a new army of Hylden. These clones, produced to the Vamperor’s specifications, mindlessly finished the construction of a superweapon that had been buried in the distant past, The Device. Near completion, the Device would cleanse the land of all non-Hylden, and cement the path for the Vamperor’s return. Kain’s reappearance after centuries was unexpected, and eventually resulted in the destruction of The Device. Stealing an Imperial Sarafan Destroyer, Kain head out to sea, to the ancient Hylden City now populated with more cloned Hylden. He confronted the Sarafan Lord and saw him unmasked, a Hylden. He thrust the reaver into his torso as the Sarafan Lord proclaimed that his immortality was assured. 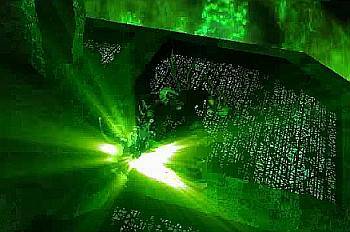 Kicking his limp-lifeless body into the Hylden Gate, Kain destroyed it and any chance of the Hylden returning to the world. The Sarafan Lord was not lying about his immortality. As long as The Vamperor exists, his power will sustain the Sarafan Lord’s existence in Nosgoth. 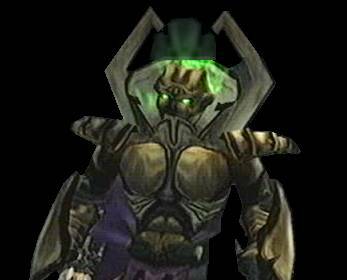 The Sarafan Lord appeared in Meridian an instant after Kain believed he had killed him. Rallying the Sarafan Fleet, the leader readied all of the Imperial Sarafan Destroyers, and led by his own massive Super Sarafan Destroyer, they set sail to the Hylden City to seek and destroy Kain, once and for all. As Kain’s adventures thrust him back in time, the Sarafan Lord follows in his floating city, the Super Sarafan Destroyer. The Dark Lord of the Sarafan learns more of his adversary and becomes obsessed with finding him. 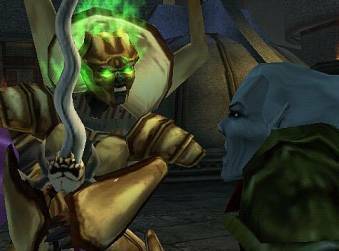 When the two do eventually confront each other, the Sarafan Lord astonishes Kain by revealing that his Hylden appearance was just a second mask, that the true reason he can exist outside the Demon Dimensions is because he is not the same as the others, he is not one of the Hylden. Asking the vampire to join him, Kain retorts that he will never, and the Sarafan Lord in response reveals the link is between the two of them that will terrify Kain, changing him forever.